This zip file contains teacher-generated files developed to be used with the textbook Album published by Houghton Mifflin Company. Album is a collection of short stories intended for intermediate and advanced Spanish students as they transition from highly controlled materials to the appreciation of authentic literary works by Spanish and Latin American authors. Included in this zip file are a handout (created and used to supplement the textbook material), one or more quizzes, a chapter exam, one or more word searches, one or more crossword puzzles, and Clipart associated with the vocabulary and grammar in each story. 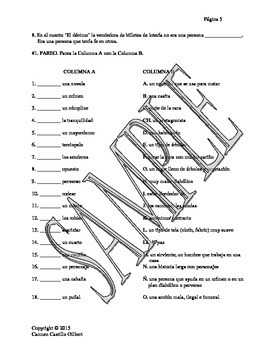 Answer keys are available for an additional $10 upon request. Contact the seller at cacegi@comcast.net for information. All files are editable since they are in MS Word or Powerpoint. The puzzles are pdf files.